XP24™ is the pinnacle compound of the extremely successful XP™ Series of compounds engineered by Carbotech™. This compound is based on the same fundamentals that exist in all other Carbotech™ formulations. XP24™ has even more initial bite, more overall bite, and more torque along with the most linear torque curve we have ever offered. 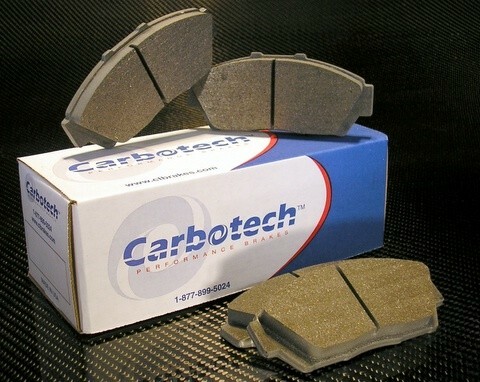 The thermal characteristics are of the highest Carbotech™ offers along with one of the highest coefficient of friction ratings offered by anyone in the braking industry. This compound is the longest wearing compound Carbotech™ offers as it was originally engineered for endurance applications at the highest pro racing levels. This revolutionary new compound has been extremely successful with open wheel, closed wheel, sprint and endurance applications. Carbotech™ XP24™ is NOT recommended for use as a daily driven street pad due to possible elevated levels of dust and noise along with the necessary heat required to work properly. Note: Please feel free to contact us if you have questions regarding your brake pad selection and your specific application.